From the origins of cinema to today's television, there has been an enduring relationship between science and the screen. It is widely accepted that cinema owed its birth to the experiments of scientists and the tinkering of technologists, just as the tastes of fin de siècle audiences for spectacular entertainments were a necessary midwife. Late 19th century scientists, especially in medicine, had become deeply interested in visualisation, and had invented new techniques, for example to visualise the pulse, or to analyse animal motion. After the invention of cinema, scientists continued to a limited extent to use the cine camera as an instrument in their research, but the screen's greatest significance for science has been as a medium of communication with the public. And yet science films and television programmes have never been a genre in their own right: the first science films were cinematographic novelty acts; scientific documentaries are types of documentary; and television science programmes are a sub-genre of non-fiction programming. The first British science films for a public audience were shown at the Alhambra Music Hall in Leicester Square, London, in August 1903. Their claim to be scientific rested on the technical feat of filming through a microscope. This revealed an 'Unseen World', as its protagonists, Charles Urban and Francis Martin Duncan , described its subjects, which included Cheese Mites and protoplasm moving in a sample of Canadian Pondweed. These microscopic studies were complemented by brief observational films of animals, including toads, tortoises and bees. Public reaction was enthusiastic, and by 1930 nature films had become an established genre. Filmmakers soon developed from the single shots - or series of shots artlessly combined - that comprised the first films to carefully structured life-cycle narratives, often with a decided anthropomorphic cast. 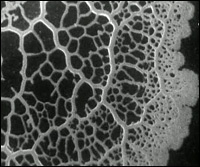 The British Instructional Films series Secrets of Nature (1922-33) produced as many as 30 nine-minute films per year. These were not, however, popularisations of academic science, but the products of enthusiastic amateur scientists, such as Duncan and Percy Smith , who displayed great ingenuity in making devices to achieve dazzling close-up and time-lapse photography. The makers of 'interest' films also featured the human world, most often in the form of technological marvels to match the natural wonders of the nature films. One example is Urban 's Bird's Eye View of Paris (1910)¸ a series of aerial shots taken from an airship. This kind of film also saw development in its narrative structure, for example the 'day in the life' approach taken in Britain's Imperial Airway (1924). In Britain, it was the documentarists at the GPO Film Unit who brought a new intensity and passion to the representation of technology, by the application of Russian montage techniques, creating a kind of technological sublime in films including The Coming of the Dial (1933). Favoured subjects included modern forms of transport, especially air travel; electricity, especially hydro-electricity; and telecommunications. In these films, technology is shown in true Modernistic style as transforming human experience. A fine late example is The Peaceful Revolution , made for Associated Electrical Industries in 1961. Professional scientists were slow to turn to the cinema to promote their worldview. In 1934, Gaumont British Instructional made a series of record films in which Eminent Scientists read brief reminiscences to the camera. A more concerted partnership between scientists and filmmakers came after 1935, when the documentarist Paul Rotha set up an organisation, Associated Realist Film Producers , which counted the biologists J.B.S. Haldane , Lancelot Hogben and Julian Huxley among its advisors. These were some of the most prominent members of the 'social relations of science movement', who were committed to demonstrating the social value of science. The social concerns about the impact of the Depression that they shared with the documentarists were at the root of their engagement with documentary. The first fruit of this collaboration was Edgar Anstey 's scientific lecture film Enough to Eat? (1936), on the highly-charged subject of malnutrition, which featured Huxley , seen on screen, as commentator. Nutrition and food supply were favoured subjects for films of this kind, which promoted science's moral role. Later examples were The World is Rich (1947) and Stuart Legg 's Food or Famine (1961). These films were of a kind that promoted 'scientific' rationality, for example in architecture and planning more generally. Scientific films aimed at a general adult public that explained scientific and technical principles for their own sake were comparatively rare before the Second World War. The outstanding example, the Shell Film Unit 's Transfer of Power (1939), explains the evolution of gear wheels, using lucid animated diagrams combined with carefully-shot sequences of levers and gearing systems ancient and modern. After the Second World War, nature films continued to be a staple of scientific filmmaking, especially with the work of Oxford Scientific Films . Technology documentaries continued to feature in the output of major industrial concerns, especially the oil companies. Films demonstrating the social role of science were somewhat eclipsed as the Cold War got underway, although films on environmental issues showed a similar combination of highly-wrought technique and moral concern about the role and impact of science and technology. All these genres also featured in different strengths as television began to become the dominant medium of science on screen from the mid-1950s. But it was in this new medium, especially after 1957, that science news and the live exposition of scientific principles became dominant concerns. Boon, T. (2008) Films of Fact: A History of Science in Documentary Films and Television, London, Wallflower Press. Britain's greatest contribution to cinema?